During high school and college, Paul and his friends worked as laborers on a local golf course. With plans of going on to law school someday, Sutter was simply enjoying the world of golf and the great outdoors. He learned the job quickly and rose through the ranks, first as foreman and then as second assistant. 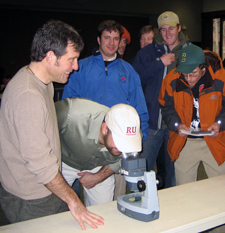 But it wasn’t until his Superintendent recommended that he attend the three-week program at the Rutgers Professional Golf Turf Management School that Paul realized the full potential for a career in golf turf management. "During the three-week program, I started to learn the science behind why I was doing what I was doing on the golf course," Sutter said. "It gave me a huge base of knowledge that I hadn’t had before." Armed with the knowledge of what he calls "real life on the golf course," Sutter landed a position as Assistant Superintendent at Bay Shore Municipal Golf Course in Miami, Florida. He continued on to two more successful Assistant Superintendent jobs at American Golf, the management company for the New York Parks Department, and Leewood Golf Club in East Chester, New York. Gleaning even more knowledge from these experiences and a very influential mentor, Sutter landed his first Superintendent position at Emerson Golf Club in Emerson, NJ in 2003. Now Superintendent of Oronoque Country Club in Stratford, Connecticut, Sutter can look back on his career so far and recognize the value of "having the Rutgers name" on his resume. "Rutgers is definitely recognized as one of the top golf turf management schools in the Northeast," he said. "I have run into so many graduates who now have successful careers in my field." For more information on career opportunities in the golf turf management and related industries or the three-week preparatory short course at Rutgers, please visit www.golfturf.rutgers.edu or contact Marissa Kosko at 848-932-7264 or via email: marissa.kosko@rutgers.edu. "[At Rutgers] I started to learn the science behind why I was doing what I was doing on the golf course." "Rutgers is definitely recognized as one of the top golf turf management schools in the Northeast." "The instructors here at Rutgers truly care about helping each student fulfill their dreams in the golf industry. I have been able to go further than I had ever dreamed."